WEEKEND SPECIAL – book 3 nights and pay $150.00 per night per couple. Additional couple pay $100.0-0 per night. MIDWEEK SPECIAL book 4 nights and pay $150.00 per night per couple. Additional couple pay $100.00 per night. Receive complimentary aperitif and chocolates on arrival. When booking please mention our website booking specials to receive the above tariff. AAA 4 Star Rated Self Contained Spa Country Cottages Blackwood River Valley. Redgum Hill Country Retreat offers private, relaxing, quality accommodation located in the heart of the South West. The property has easy road access to the key areas such as the Golden Triangle, Augusta, Pemberton, Manjimup and Bridgetown. Set amongst natural forest and beautiful countryside, the property boasts over 60 varieties of birds and local wildlife. The AAA 4 Star rated self contained country cottage accommodation offers walks, reading, day trips, peace and tranquility. 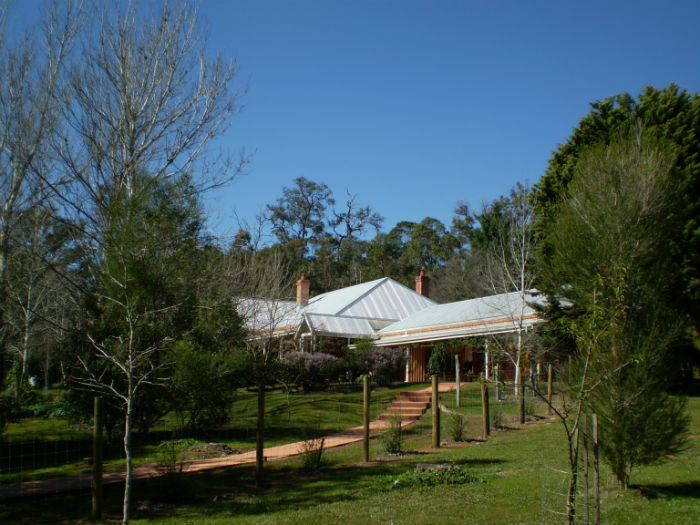 Redgum Hill provides long or short term accommodation in quaint country cottages. Accommodation comprises two self-contained cottages overlooking the dam (Duffy’s) and Blackwood River (Gumnut). Duffy’s cottage has three bedrooms, a large cedar spa and verandah overlooking the dam. Gumnut Cottage has one attic bedroom, a Juliet balcony and spa. A separate villa adjacent to the main house has two Queen size bedrooms both with en-suites and a large verandah overlooking the property garden. The villa accommodation also includes a separate kitchenette and lounge/dining room. There is a spa facility in the garden summerhouse which is 30m from the villa along a path. Parking is available for all accommodation free of charge. Redgum Hill is small private and peaceful and a perfect place for that romantic peaceful break.